4 apartments, type F1, 45m². 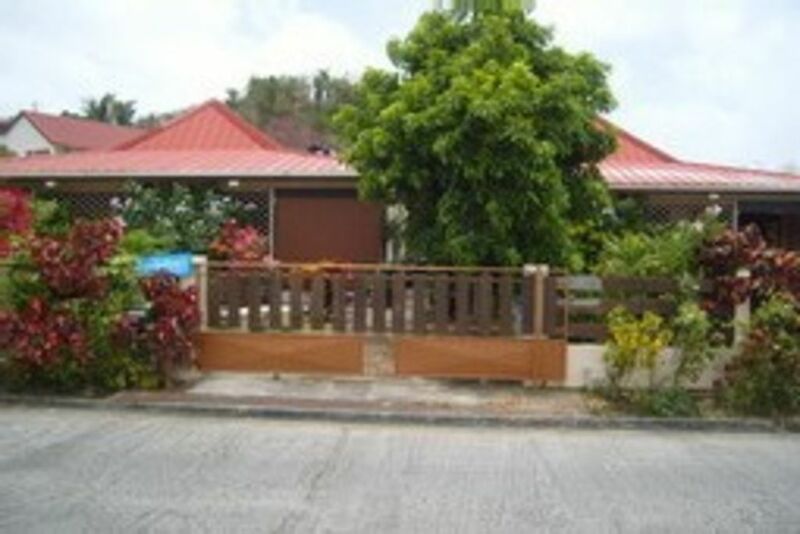 Furnished tourist unopened fully equipped beach 300 meters. Beach 300 meters, (5 minutes walk from the sheltered beach): The tip of the sailor near the Mediterranean club. (No Sargasso seaweed). The villa is composed of 4 air-conditioned, independent, type f1, 45m2 without vis-à-vis. Capacity: 2 adults and 2 children. Fixed Phone Card in the Garden. Internet and Wifi in the accommodation. Sheets, towels, tea towels provided every 8 days. Bring your beach towels. Hot water. Each unit is equipped with a TV: flat screen and is described as such: a large terrace serving as a dining area with a direct communication door with the kitchen, this fully equipped kitchen open on a large room of 25m2 including a part stay and a night party, separated by a curtain. Equipped with a large bed + a small bed 190x80 (photos), toilet composed: a shower, washbasin. Fully equipped kitchen, microwave oven, 2 door refrigerator (fridge and freezer). Located 600m from the town of Ste Anne with its market and local flavors. Iron and board on request. Located south of the island dry, sunny air temperature is 30 degrees and the water is 27 degrees year round. The island has micro climates and offers a great diversity both in terms of flora and fauna. Other beaches nearby: Salines beach, Anse trabaud, Anse Michel, cove meunier. Discount and discount according to period (see terms with the owner. Respectful behavior of the basic rules of life in society is expected of travelers. At the end of the stay, put the sheets, mattress protectors and pillows, as well as the towels ashore in the bathroom. Wet or wet cloths in the shower tray. You must close the trash bag and put it in the container provided for this purpose. The cleaning fee is not requested at departure. The apartment must be handed OWN. In case of non-respect of the internal rules, a flat rate of 50 € will be retained for the household. No smoking, no pets allowed. Do not make noise after 22 hours. a garden in front, a closed courtyard behind, a terrace with garden table chairs dining area, barbecue in the garden. Iron and table see home. Hot water. conditioning. At 30 meters in the field, laundry, internet connection, takeaway, restaurant, breakfast from 6 am Prepaid card phone available. Beach at 300m: LES BOUCANIERS is the beach of the Mediterranean club, white sand beach and coconut trees as far as the eye can see. RESIDENCE BLUE ALIZE 68 DOMAINE DE BELFOND 97227 SAINTE ANNE 'MARTINIQUE south of the island dry and sunny climate all year long (micro climate) temperature, air 30degrees, water 27 degrees, on average all the year flora and fauna very varied to discover. Attractive prices according to season and duration.